The Oglebay Winter Festival of Lights, begun in 1985, has grown into one of the nation's largest holiday light shows. It attracts more than a million visitors per year, including 3,000 tour buses from more than 36 states. 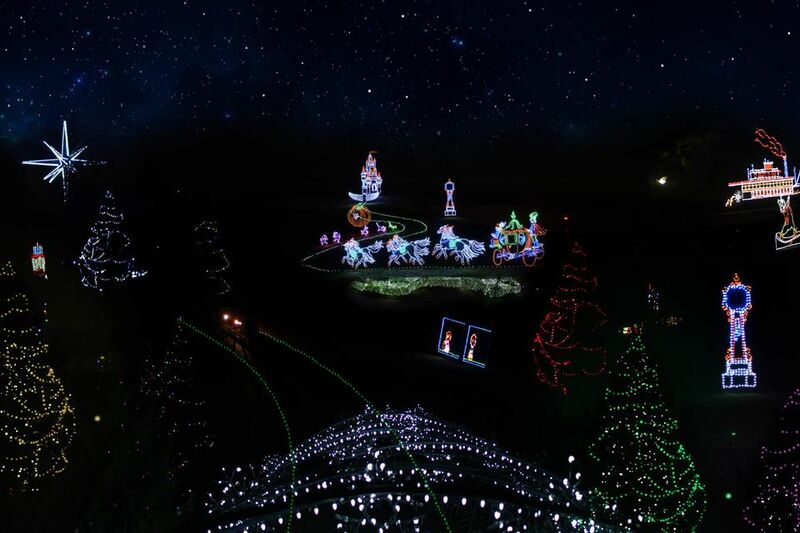 The show, located in Wheeling, West Virginia, has even been listed in many online publications as the best Christmas display in the United States. The Oglebay Winter Festival of Lights covers more than 300 acres over a six-mile drive throughout the Oglebay resort. Ninety displays and over one million lights are featured in this celebration. The entire Winter Festival of Lights has also been fully converted to energy-efficient, brilliant LED. Original display favorites in the Oglebay Winter Festival of Lights include the animated Snowflake Tunnel, a Candy Cane Wreath, The Twelve Days of Christmas, the massive Polyhedron Star, and Willard the Snowman, named for the TV weatherman Willard Scott who 'turned on' the lights in 1986. Directional Snoopy characters help guide visitors through the tour. After driving through the display, be sure to check out the life-size Nativity scene and its surrounding Christmas Tree Garden, as well as the elaborate holiday decorations at the Mansion Museum and Wilson Lodge. There are some exciting debuts this winter season. First, you can now experience the whole show in 3D with holographic glasses. Then, there's a whole new Winter Carnival area at Levenson Shelter; this family-friendly event includes holiday train and wagon rides for kids as well as a children's straw maze. An exciting light and music show at the Good Zoo at Oglebay runs approximately every 20 minutes from 5 p.m. to 8 p.m. Sunday through Thursday, and 5 p.m. to 9 p.m. Friday and Saturday, with 35,500 lights choreographed to holiday music. More zoo fun includes Holiday Laser Shows at the Benedum Theater, the O-Gauge Model Train Exhibit, and live reindeer. Admission to the zoo is required. The hilltop and gardens area of Oglebay Resort is beautiful, even in winter, with 150 hanging baskets of light, plus thousands of lighted flowers and trees between the Visitors' Center, Gift Shops, and Mansion Museum. The Oglebay Winter Festival of Lights is held at the Oglebay Resort & Conference Center in Wheeling, West Virginia. For the 2018-2019 holiday season, the Winter Festival of Lights will run between November 9, 2018, and January 1, 2019. The Winter Festival of Lights is viewable Sunday through Thursday until 10 p.m. and on Friday and Saturday until 11 p.m. There is no admission charge for the Oglebay Winter Festival of Lights, but donations are appreciated (and generally expected). A one-time donation per carload is valid for the entire festival season. Trolley tours are also offered from Wilson Lodge on a first come, first-served for basis. Weekends at the Oglebay Winter Festival of Lights are so popular that you should expect to sit in line for up to two hours to get in. Locals and visitors alike agree that it's worth the wait. Oglebay (and the Winter Festival of Lights) is located in West Virginia, four miles from I-70 at Exit 2A. It is 60 miles from Pittsburgh via I-79 south and I-70 West; 120 miles from Columbus via I-70 east; and 150 miles from Cleveland via I-77 south and I-70 east. The Ihlenfeld Dining Room at Wilson Lodge offers a popular holiday buffet nightly, and the seven specialty shops at Oglebay are stocked with unique gifts. Downtown Wheeling also gets into the holiday spirit with dozens of homes, shops, and business establishments ablaze in holiday lights.